If we had to pick our favorite exercises, they might all come from this list. You'll see what happens when you add elastic resistance to the Stationary March. One thing is for sure. You'll never do another situp again. Speed Coaches and Physical Therapists all recommend elastic resistance as one of the best ways to increase strength and speed. 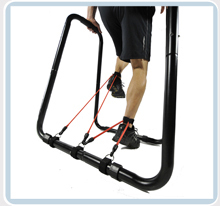 Resistance Knee Raises focus elastic resistance like a laser beam on your Lower Abdominals, Hip Flexors and Hamstrings. These are critical core muscles used for running. And how about Ring Push Ups? Using the Dip Machine and Push Up Rings to free your hands from the ground adds at least half a dozen new muscles to what was already a full body exercise. Become Your Own Personal Trainer. The exercises in this workout are some of our favorite exercises, but if you have some favorites from the Beginner Workout feel free to substitute or add them to this workout. Once you are familiar the Ultimate Body Press exercises, you have everything you need to design your own great muscle building workout. Get out a note pad and write down which exercises you'd like to do that day. Write them on a sticky note and put it on the wall where you workout. Give it a try. Your new knowledge of these simple, go anywhere exercises will have you looking and feeling great for the rest of your life. The best full body push up exercise. This is an awesome exercise for strengthening your shoulders, back and even muscles in your lower body. We know this one looks funny, but we can get away with it because this is a home workout. It's also great for core stability. A pull up motion with less resistance. A most popular strength move and for good reason.